Muuu Beee is a new productive activity on agri-food sector that started at year 2016 the Special Work Center of MAP Foundation, entity that works to improve the life quality of people with disabilities and risk of social exclusion from Ripolles. 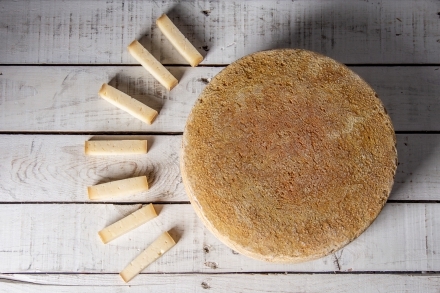 Collect the testimony of the artisanal cheese-making workroom Herbacol de Queralbs, which has been elaborating since 2001, and preserves the main products and the artisan processing with Ripolles raw material. MUU BEE is made from cow's milk that comes entirely from Mas La Folcra farm in Sant Joan de les Abadesses, a historic pairing house dedicated to milk production and breeding of Friesian calves. It has 60 milk cows, 40 of them are milked. It is a project linked to territory, generating a sustainable activity which creates employment for people with special difficulties and seeking cooperation with all agents.